Giving guests a chance to observe procedures up close, the Animal Care Center at Busch Gardens Tampa pulls back the curtain on what is often done behind the scenes at most facilities. Along with being able to see procedures being done on animals in the park’s collection and wildlife cases brought in for rescue, guests can also meet animal ambassadors and learn about the diets and nutrition of different species in the show kitchen. Scenes for the popular television show Wildlife Docs are filmed here as well. Located across the path from the Asian Elephant habitat, the Animal Care Center lets guests see what it takes to look after the park’s collection of wildlife, including their nutrition and medical care. The building is open to guests daily, generally from the time the park opens until late afternoon. Entering the building, the first room holds a number of chairs and show kitchen, where presentations on meal preparations for different animals take place. This area is also used for meet and greets with smaller animal ambassadors. The schedule for both nutritional presentations and any animal ambassador appearances varies daily. The overhead monitors here show any scheduled procedures in the hospital area in the next room. Since the Animal Care Center is used for both pre-scheduled procedures and those requiring emergency care, the schedule can vary widely from day to day. Guests are most likely to see a procedure in the exam or operating room in the morning or early afternoon Monday through Saturday. 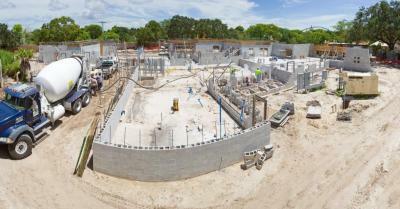 Guests can see into three of the hospital areas, including the main exam room, operating room, and diagnostic lab. The exam and operating rooms feature floor to ceiling glass windows, and procedures are done in full view of guests. In addition to the exam and operating rooms visible to guests, the Animal Care Center also has several areas behind the scenes that are important to the care of the park’s vast collection of animals. The radiology room is located just off the main exam room, and is partially visible through the doors leading into it. Here, x-rays of animals can be taken and will normally be displayed on overhead monitors for guests to view as well. A fully stocked pharmacy is also located at the Animal Care Center with a variety of medications and other supplies. Nearby are the animal hospital wards, where patients that need extra care can be held in close proximity to all of the facilities needed. There are three wards – a mammal ward, reptile ward, and avian ward. There is also an intensive care unit room available for more critical patients who need extra care and monitoring. Another very important area behind the scenes in the Animal Care Center is the soiled and clean utility room and the scrub area. Any instruments used in the care of animals is thoroughly cleaned and sterilized before being stored for their next use. Almost all of the park’s animals weighing up to 2000 pounds can visit the animal care center for any routine procedures or emergency medical needs. Only the largest animals, like elephants, rhinos. giraffes and hippos require the vets to visit them in their habitats for medical care. In late April 2011, construction walls were erected around much of the rhino habitat in Nairobi, across from the Asian elephant habitat. 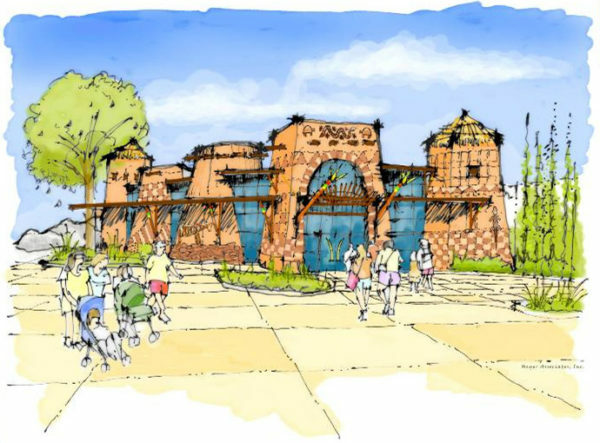 Busch Gardens will welcome guests to closely observe and even take part in the animal care experience when the Tampa park opens its new Animal Care & Nutrition Center this winter. 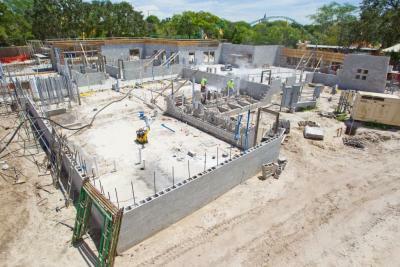 From nutrition to treatments, X-rays to surgeries, much of Busch Gardens’ animal care will be conducted in guest view in this new state-of-the-art facility. The new, nearly 16,000 square-foot facility will be built where the rhino exhibit is currently located in the Nairobi area of the park. The park’s current animal care center is located behind the scenes. The two major guest components of the new facility will be a nutrition center and treatment rooms. The nutrition center will feature a kitchen similar in set-up to a cooking show on television. Educators will lead demonstrations several times a day on the planning and preparation of animal diets. Guests will even have the chance to assist in preparing and doling out the range of food the park provides its animals, from fruits and vegetables to crickets and mealworms. The treatment center will allow guests to watch as Busch Gardens’ skilled vets do preventative checkups, treatments and surgeries on animals. Guests will be able to see into the rooms through glass walls, and audio capabilities will allow guests to talk to vets working behind the glass. Cameras placed over the exam table will show unique vantage points to guests who can watch on monitors. During treatments and surgeries, zoo educators will also be on hand to talk about what’s taking place. In addition to the guest views, the new facility will also include animal recovery rooms, vet offices and research stations. Guests can also participate in a diagnostic exercise by scanning an interactive activity card at several stations as they follow an animal from diagnosis to treatment to blood and lab work to a final outcome. 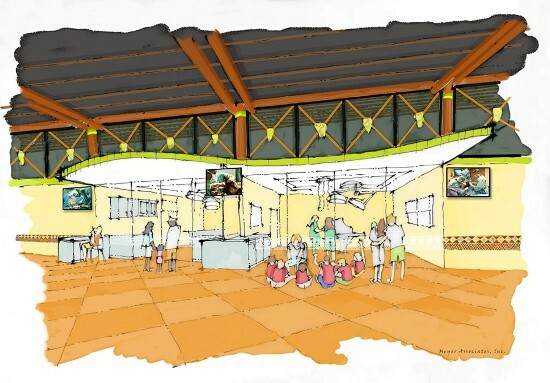 Some of the concept art for the Animal Care Center shows the overall look of the building, as well as a glimpse of what the viewing area into the procedure rooms would look like to guests. 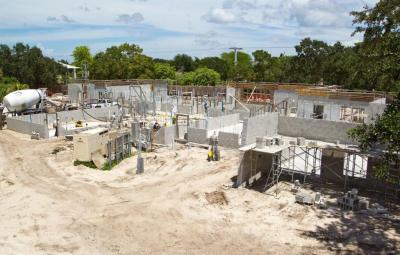 In late August 2011, the park shared a few images of construction progress on the Animal Care Center on their blog. A media event was held on January 12, 2012 to show off the new Animal Care Center ahead of its official opening. Jack Hanna was on hand, and the uniqueness of the center in how it plainly shows guests exactly how the park’s animals are care for was touted. The nutrition center, treatment rooms, clinical lab, and interactive diagnostic center were all shown off as part of the media tour. 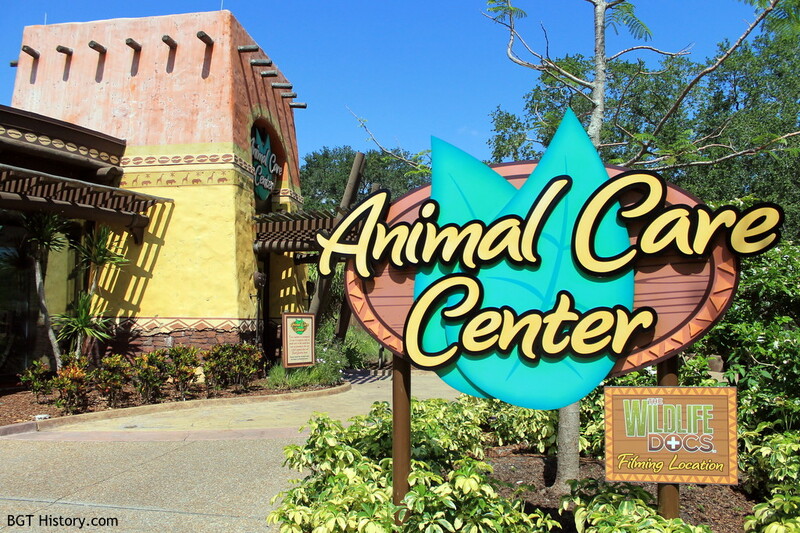 The Animal Care Center officially opened to the public on January 23, 2012. The project reportedly cost the park $5 million. Around that time, it was reported the park cared for 2,000 animals representing over 300 species, and those animals consumed 1.4 millions pounds of food annually, or an average of about 4,000 pounds a day. The new center certainly did its part in both the care of the animals and with the prep of some of their meals in the new show kitchen. The first birth at the Animal Care Center occurred on February 5, 2012 when an emu chick hatched. The chick, along with another hatched the following day, would be moved to Jambo Junction shortly after their births. The new center saw action nearly every day after opening, including a wild common loon brought in by a local wildlife rescue with a life-threatening issue in February. X-rays revealed fishing equipment – literally hook, line and sinker, were ingested by the bird. Park veterinarians were able to perform endoscopic surgery to remove all the fishing equipment via the throat using a long pair of tweezers. 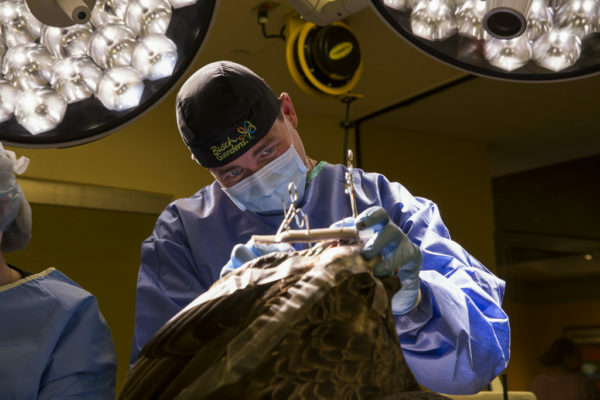 The bird recovered fully, and was able to be released back into the wild just several days after the surgery. On August 12, 2013, the park announced that The Wildlife Docs television series would debut on most ABC stations around the country on October 5 as part of the Litton Weekend Adventure block of shows. Much of the new series was filmed at the park and inside the Animal Care Center, where veterinarians and other staff take care of both the park’s collection of animals and rescued wildlife brought in for rehabilitation. On the Fourth of July in 2014, a southern American Bald Eagle was found unable to fly at MacDill Air Force Base in Tampa. Park staff, military police, and a local wildlife rehabilitator rescued the injured eagle. 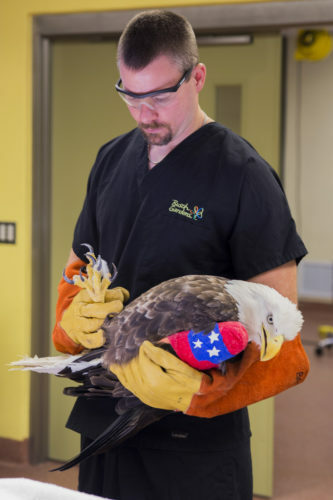 Upon arrival at the Animal Care Center, Busch Gardens veterinary care staff assessed the eagle and found one of the wings had broken bones. The break was wrapped in red, white and blue bandage tape to support it until surgery was performed on July 7. On November 29, 2014, the park celebrated World Tamandua Day at the Animal Care Center. Interactions with Sati, a Southern Tamandua, and other South American animal ambassadors took place. A special enrichment activity and nutrition talk with Zoo Nutritionist Dr. Heidi were also held. In 2015, the Animal Care Center was featured in an episode of Animal Outtakes, a series produced by ABC 7 WWSB. Also in 2015, the Animal Care Center placed 10th in the USA Today’s Readers Choice for Best Zoo Exhibit. Additional images and details on Animal Care Center will be added in the future.